The school u-8 team clinched the third place defeating St. Stanislaus High School, Bandra in the 3rd and 4th place play off position at MSSA grounds on 8th March 2019. The school u-8 football team won the 3rd place in the MSSA inter school football tournament played at Azad Maidan on 16 Feb 2019. We beat St. Stanislaus 4-0 in the playoff for the 3rd and 4th position. Our U/12 Football A-team lost a close finals with Bombay Scottish to emerge Runners up (Div I) of the MSSA inter school football tournament played at Azad Maidan on 25th January 2019. The team lost 1-0. Our U/12 Football B-team won their match to claim the 3rd place (Div -2) at the MSSA inter school football tournament played at Azad Maidan on the same day. Our u/14, u/12 and u-/10 football teams made a clean sweep of the football titles at SFA football tournament played at D.Y. Patil Stadium, Nerul in the second week of December 2018. Master Yohaan Panjuani 5D was awarded the prestigious Abhinav Bindra scholarship at the SFA championship for outstanding performance in Football. Our U-14 football team emerged Runner’s-Up at the DSO Shalay Inter-State football tournament played at Chhatrapati Shivaji High School and Junior college, Sagroli,Taluka Biloli, Nanded from 11th to 13th Nov 2018, Our team lost to Kolhapur 4-1 in the tie-breaker in the finals. Three of our boys have been selected to represent Maharashtra – Master Vedant Sawant 9-D, Master Jorryn Fernandes 9-D and Master Garrick D’Souza 8-B. They will be leaving for Nagpur on 19th November for the Camp and then to Assam for the National matches. Our U-14 Football Team are the winners of the DSO Shalay inter school football tournament played on police grounds, Naigaon on 6th Oct 2018. We beat St.Marys ICSC 4-2 via a tie breaker. U-17 football team crowned DSO city champions! Our school u-17 football teams are the dons of football yet again – this time in District Sports Office (DSO)football tournament when they beat Navy Children school and Junior College, Colaba 1-0 in the Mumbai city finals played at Azad Maidan on 20 July 2018. Our u-16 football team emerged winners of the Reliance foundation cup (Zonals). They beat Ahmedabad 5-0 at the DSK Internationals ground – Pune on Friday, 8th Dec 2017. They now qualify for the nationals to be held later this month. Earlier they won the Mumbai city edition defeating St. Francis D’ Assisi 2-0 in the finals played at Reliance Corporate Park – Ghansoli. Ahmed Sailor champions – third time on the trot! The school u-16 football ‘B’ team won the 3rd place in the II Division of the MSSA organized inter-school tournament beating St. Lawrence (Borivali) 2-1 in the 3rd place playoff match at Cooperage ground- Churchgate on 8th Aug 2017. The school u-14 football team emerged Maharashtra state champions defeating Kolhapur 1-0 in the Division finals played at Balewadi, Pune on 12th Aug 2017. The team has thus qualified for the Nationals to be played in Delhi. Master Gaston D’Silva selected as one of the probable in the India u-16 squad for the 2017 FIFA u-17 World Cup to be hosted by India. Aaron Nazareth, Aman Manghi, Joshua Dsouza and Mannan Dang were selected to represent Maharashtra State Sub-Junior Football team in the National Football Championship Boys 2015-16 held at Seoni, Madhya Pradesh..
Our school has traditionally been a bastion of football talent. The school has won various trophies and championships . . Our under 16 School Football team – winners of the MSSA organized Challengers Cup (2015-16). Clivert Millar of Std. X was awarded the top-scorer prize of the tournament. Mumbai city champs! Our school u/14 team won the DSO city finals at Azad Maidam (MSSA) beating Campions School 3-2 in the tie breaker. Aman Mangi was awarded the best player. Congratulations! Our school u-12 A team retained the late Olympian Walter D’Souza trophy defeating St. Stanislaus High School, Bandra 2-1 in the finals of the MSSA conducted tournament. The finals were played at St. Stanislaus grounds, Bandra on 20 Feb 2019. In the same tournament our school B team clinched the third place defeating St. Dominic Savio Andheri via the tie-breaker. 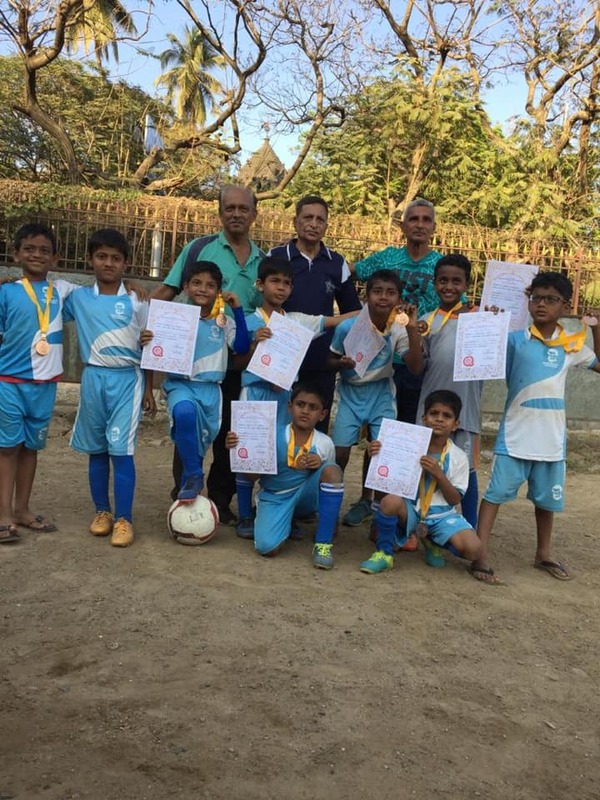 The school u-10 A team secured the second place in the MSSA conducted tournament for the Oliver Andrade trophy losing 2-0 to St. Stanislaus school, Bandra in the finals played on 18 Feb 2019 at St. Stanislaus grounds, Bandra. The school B team secured the 4th place in the same tournament. In the u-12 MSSA tournament the u-12 A team played St. Stanislaus in the finals at Stanislaus grounds on 15th Feb 2019, and after a tied score at full time, our team lost in the tie breaker to secure the second place. The u-12 B team clinched the third place defeating Dr Antonio Da Silva 3-1 at the same tournament. 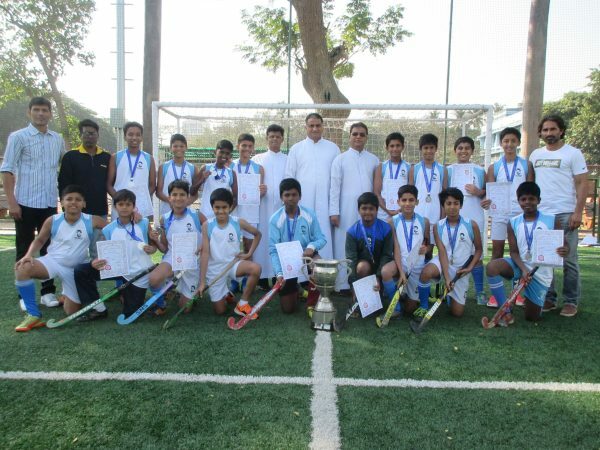 Our u-14 hockey team clinched the runners-up trophy at the MSSA organized inter-school hockey tournament for the Fr. O’Donnelly trophy. The team lost to St. Stanislaus High School, Bandra 1-2 in the finals played at Stanislaus grounds on 13th Feb 2019.
u-14 Hockey team – MSSA champions! Our U-14 hockey team, won the MSSA inter school hockey tournament played at St. Stanislaus ground, Bandra defeating St. Stanislaus High School, Bandra 2-1 in the finals on 1st Feb 2019. 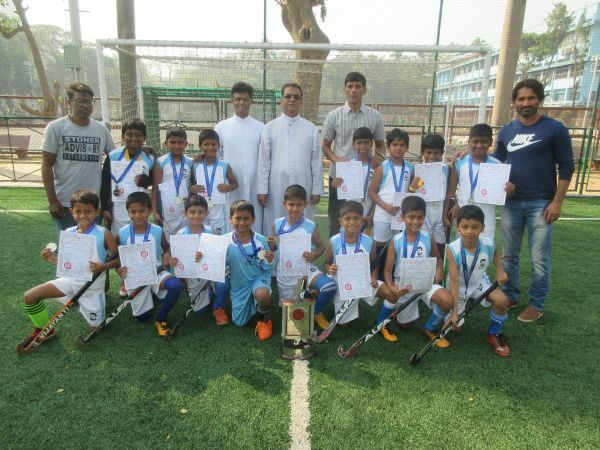 Our U-12 Hockey team won the SFA inter school Hockey tournament played at BHA stadium, Churchgate in the second week of December 2018. Our U/12 Hockey ‘B’ Team won the 3rd place. Congratulations to our U/16 Hockey Team. Runner’s Up of the MSSA, Ahmed Sailor Trophy. We lost to St. Stanislaus in the finals played at Sports Authority of India Grounds, Kandivali on 17th Dec 2018. U/14 Shalay Team won Against Antonio D’Silva High School Dadar 1-0. U/17 Shalay Team won against Antonio D’Silva High School Dadar 5-0. U/15 Team (Nehru Cup-City level) won against Antonio D’Silva High School Dadar 4-1. U/17 Team (Nehru Cup-City level) won against Guru Nanak High School Sion Koliwada 3-1. Mannan Dang and Yash Yadhav were selected to represent Maharshtra in u-14 category. Hockey has been a major sport for the school..
Master Araav Jaggi 9B and Master Zanan Ahmed 8D have been selected to the Junior RF NBA Mumbai All Star team. The selection was from among the top basketball players from the different schools of the city of Mumbai. In the NBA tournament conducted for the schools of Mumbai, our u-14 school basketball team, after having qualified for the Jr. NBA Mumbai City Finale, topped the group of three to win the championship. 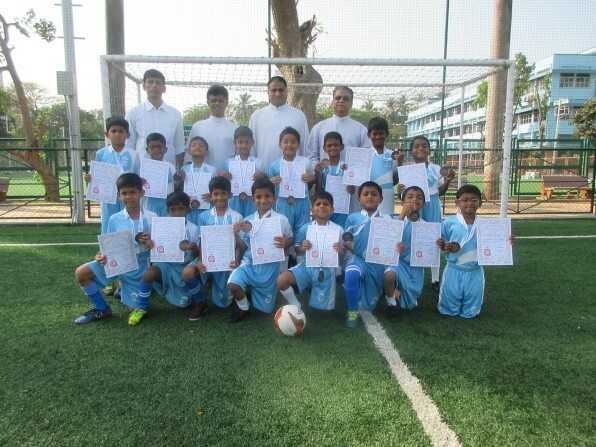 The top three teams included St. Joseph’s Wadala, Bombay Scottish, Mahim and Don Bosco, Matunga. In the round robin league, our school team defeated both the teams to emerge the leaders at the Finale and win the NBA tournament that concluded on 01 March 2019 at St. Stanislaus grounds, Bandra. 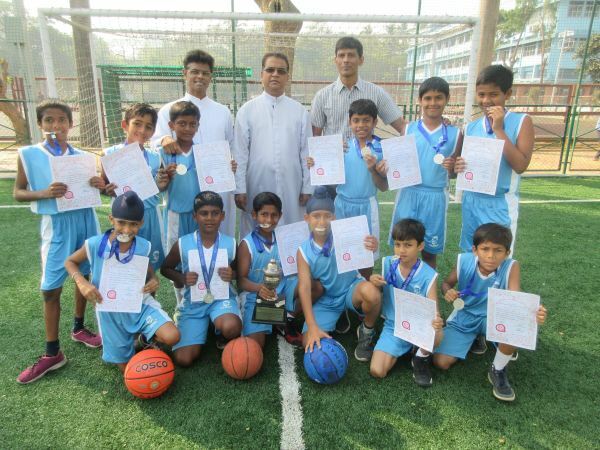 The school u-11 basketball A team lost a close final to arch rivals and sister institution St. Joseph’s High School, Wadala to secure the second place in the MSSA conducted tournament. The boys lost 13-14 in the finals played at Azad Maidan basketball court on 20 Feb 2019. The school u-13 basketball ‘A’ team won the third place defeating Lakshdham school 22-13 in the 3-4 place play-off match on 1st Feb 2019. Our school u-16 basketball team emerged runners-up at the MSSA held inter school basketball tournament. The boys lost to St Joseph’s Wadala 26-28 in a closely contested final held at Azad Maidan on 20-12-2018. Master Nathan Barretto 8-D, Vedant Rawoot 8-F and Somesh Shetty 7-D, represented at the Sub-Junior 45th Maharashtra State U/13 Inter-District Basketball Championship organized by NJ Basketball Academy from 28th July to August 1st 2018, Balewadi, Pune. They formed part of the winning team. Our U-16 Basketball team won the Sir Ratan Tata Trophy defeating St. Joseph’s High School, Wadala 36-27 in the finals played at MSSA ground Azad Maidan on 11th Dec.2017. Our basketball players dished out an outstanding performance in the 3rd inter-school Basketball tournament held at Don Bosco, Panjim, Goa in the last week of October. Aryan Chopda and Vedant Rawoot – Winners of the most valuable player’s trophy. Mr. Vedant Rao – Winner of the upcoming player of the tournament. In Basketball, our U/17 Basketball Team won the DSO Inter School basketball finals played at Shishuvan sports Pavilion- Matunga. In Basketball, our U/17 Basketball Team won the DSO Inter School basketball finals played at Shishuvan sports Pavilion- Matunga. Our boys outplayed Cathedral and John Connon High School 42-28. 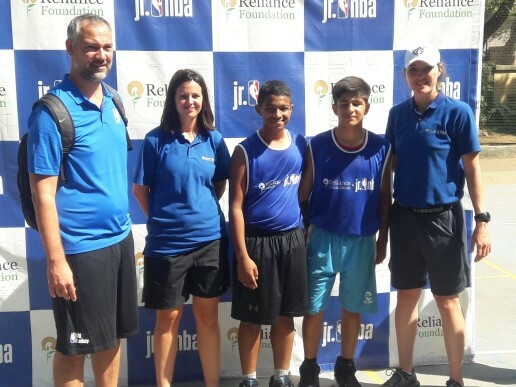 The U/14 Basketball team however suffered a setback in the same tournament when they lost to their rivals and sister-concern St. Joseph’s High School, Wadala in the finals. sMaster Sankalp Panda who selected for the U/13 basketball team to represent Maharashtra at the National championship at Puducherry. It is an active hub of basketball in Mumbai. Savio Cup is held annually on our school courts which attracts the best of talent from India and overseas. Master Shivam Kadam of Std. 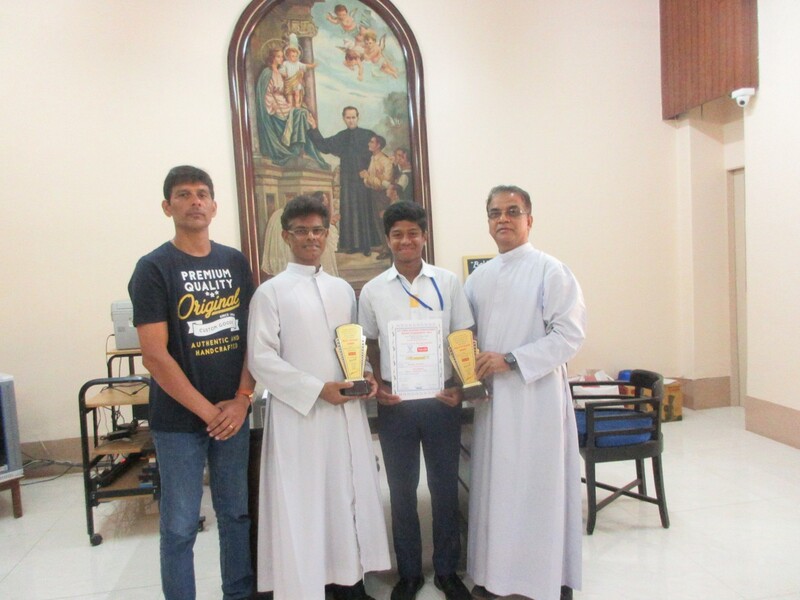 IX D amassed some valuable tennis ranking points by bagging the winners’ singles and doubles trophy in the boys’ u-16 category of the All India Ranking Super Series tennis tournament 2019. The tournament was held under the aegis of AITA and MSLTA at Practennis, Andheri, Mumbai from 4th – 8th March 2019. Shivam outclassed his opponent Master NIrav Shetty 6-2, 6-2 in the finals to claim the u-16 boys’ singles title. Earlier on, he had brushed aside the challenge of the top seed and all India no. 10 Master Arjun Kundu from Gujarat 6-3, 6-2. In the doubles u-16 category, Shivam teamed up with Nirav Shetty to get past Arjun Kundu and Anargha Kamble 6-3,1-6,10-5 in the finals to lay hands on the doubles trophy. Master Shaan Worlikar of Std 6-D claimed silver medal at the MSLTA – All India Ranking Talent Series Tennis Tournament held at Goregaon Sports Club. Master Shivam Sandeep Kadam of Std. 9D, bagged the runners-up prize in the Maharashtra Masters U/14 Lawn Tennis Tournament 2018, held at Solapur on 28 and 29 Dec. 2018. 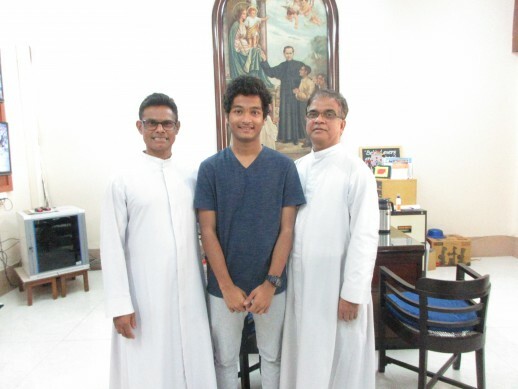 Master Jensen Pais, Std 8-D won the Silver medal in Lawn Tennis (U/14 category) at the SFA Championship held at D.Y. Patil stadium, Nerul in the second week of December 2018. Our school Lawn Tennis Team emerged winners (Team Event) – a feat achieved after 7 years – at the Inter-School Lawn-Tennis tournament held at MSSA Tennis Courts, Azad Maidan. We beat Jamnabai High School 2-0 in the finals played on 4 Nov. 2018. Shaan Worlikar 6D, won the silver medal in the U/12 Singles Category. Master Shivam Kadam of std. 9-D, was the Runner-up in the U/16 category of All India Tennis Championship Series (7) 2018, held at Practennis, Andheri, Mumbai from 17 to 21 Dec. 2018. Master Shaan Worlikar 6-D was the Runner- up at the DSO Inter state soft tennis tournament held at N.L. Complex, Anand Nagar, Dhaiser on 17th November. He has been selected to represent the school at the National level in Madhya Pradesh from 14th to 18th December 2018. All India Championship series – Shivam and Ayush pick gold! Our school Soft Tennis Team comprising 1) Shaan Worlikar 2) Jensen Pias 3) Vatsal Gholap 4) Hargun Singh Arora won the Gold in the U-14 DSO State level Tournament held at Don Bosco, Borivali on 17th Nov 2018. In the Soft Tennis U-17 Category, our team represented by 1)Ayush Hindlekar 2)Hrimay Shah 3)Aaryan Gajula won the Silver Medal at the DSO State level Tournament held at N.L. Complex, Anand Nagar, Dahiser on 18th Nov 2018. Shaan Worlikar (U-14) and Ayush Hindlekar (U-17) are further selected to represent our school for the Soft Tennis DSO Nationals to be held in December 2018. He again has made a mark at the National stage by being the Finalist in U14 and Semi Finalist in U16 – All India Tennis Super Series 2018, held at Bengal Tennis Association, Salt Lake, Kolkata from 12 Nov to16 Nov. 2018. Shivam Kadam ranks 1st in Mumbai! As per the latest All India Tennis Association ranking (as of 27 Aug 2018), Shivam Kadam of Std 9 D is ranked 1st in Mumbai, 2nd in Maharashtra, 12th in India and 44th in Asia in the u14 boys category. Master Shivam Sandeep Kadam of Std IX D bagged the runners-up prize of the U14, All India Tennis Super Series 2018, held at Sania Mirza tennis academy, Hyderabad Telangana from 13-17 Aug 2018. In tennis, Master Shivam Kadam of Std IX D, has been rewarded for his outstanding performance in the game of Tennis by *Rotary Club of Thane Down Town* with *”AWARD OF SPORTING EXCELLENCE*”. The presentation took place at Thane on 5th May 2018. Recently, he was declared Runner’s up of the U/16 All India Tennis championship 2018, held at Surat, Gujarat from 16-17 June 2018. Master Shivam Kadam of Std. VIII won the Gold medal in the u-14 boys’ category at the MSSA inter school Tennis tournament held at Bombay Gymkhana on 17 November 2017. Earlier on Master Shivam won the Silver Medal in Boys under 14 in DSO zonals held at MSLTA Mumbai on 10 Nov. 2017. He next plays in the State championship in Pune. Master Shivam Sandeep Kadam of Std 8 won the finals of DSO Mumbai City u-14 Lawn Tennis Tournament held at MSLTA Mumbai on 7 and 8 October. He now plays for the Zonals. Master Ayush Hindlekar of Std 9 won the 2nd place in the u-17 boys’ category. Master Ayush Hindlekar Std IX D and Master Shivam Kadam Std VIII D had a commendable performance at the All India Ranking Championship Series Tennis Tournament – 2017, held on 15th September 2017 at Practennis, Andheri west and conducted by Mumbai Suburban Tennis Association. Ayush won the doubles competition while Shivam emerged runner-up in the u-14 individual’s category. secured the second place in the U-17 category in the State inter-school Soft tennis tournament held in Aurangabad. Master Ayush Hindlekar of Std. 7 emerged the winner in U /12 inter school lawn tennis Premium league. Shivam Kadam was chosen to represent Maharashtra for inter-school Soft Tennis Nationals held at Dewas, Madhya Pradesh from 17 to 21 Dec. 2015. Besides captaining our school for the district, Shivam was the youngest player to be selected in state team. Brendon Barretto, Sayhan Khan, Ethan Dsouza and Shaurya Padwal – Gold medal in the 4×50 metres shuttle relay. Sayhan Khan – bronze medal in Long Jump. Mehul Kocharekar, Nishikant Kotian – silver medal in the 4×100 metres relay. Nishikant Kotian – silver medal in the 200 metres Run. Joel Nadar, Renish Nadar and Aashay Bhoyar – silver medal in the 4×100 metres relay. Pranit Pandit – Gold in the High Jump. Sayhan Khan and Nishikant Kotian were selected to represent Mumbai City team for the Maharashtra sub junior Athletic championship held at Shri Vithalrao Joshi Charities Trusts Sports Academy, Sawarde, Kasarwadi, Chiplun, Ratnagiri District on 2nd n 3rd of March 2019. Nishikant Kotian represented Mumbai City and won bronze medal in the 4×100 metres relay for boys under 10. YMCA State Athletic meet – Angadsingh Oberoi strikes gold! Royden Koli secured Gold medal in 50 metres Run and 100 metres Run for boys under 8. Angadsingh Oberoi secured Gold medal in 100 metres Run & Long Jump for boys under 10. Pranit Pandit secured Gold Medal in High Jump for boys under 12. Shreemaan Dhuri secured silver medal in the High Jump for boys under 16. Our Athletes create history – bag Tata Shied for excellence in athletics! A bagful of medals for our athletes at the DSO meet – six athletes make it to the zonals! In the DSO Mumbai city Athletics Meet held in October, Master Aameen Khan stood 1st in 800 meters, 1500 meters and 3000 meters run (boys u-17 category), Master Areeb Hussain stood 1st in Discuss Throw (boys u-14 category) and Master Anandsingh Sabrawal stood 1st in High Jump (boys u-14 category). Now they qualify for the zonal events. BCDAAA (Bombay City District Amateur Athletic Association) meet – Champions! Our school athletic team participated in the BCDAAA meet held on 10th and 11th August 2017 at the University Pavilion, Marine Lines where we won the Unique Pharmaceutical Trophy for the Best School Boys Section. Royden Koli of Std 1 won the Tara Malkani Trophy for the fastest boy in under 8 category. Rishi Jathan (Std 3) – Silver in 50 m run for boys u-8. Hrithik Swarup (Std 10) – Gold in Shot Put & Silver in Discus Throw for boys u-16. Angadsingh Oberoi – Tara Malkani Trophy for the fastest boy in the u-8 category. Arzaan Panthaky – Gold in Long Jump and Silver in 100 m for boys u-12. Krish Jain won the Bronze medal in shot put in boys under-14 category. In shot put, Master Hrithik Swarup won the second place (silver medal). The u-14 4×100 metres relay team comprising Tejas Chavan, Sakshay Pradhan, Vatsal Bhura and Krish Jain bagged the gold medal in their category. The school was awarded the prestigious A.R.M. Sidiki memorial challenge shield for the highest aggregate total points scored in the intermediate division (boys). In the Bombay City District Amateur Athletic Association at University Pavilion, Marine Lines on 8th and 9th Aug 2015, Don Bosco Matunga school won the overall championship for the Best School in Boys Section. Tejas Chavan of Std. IX won the Unique Pharmaceutical trophy for the fastest athlete in u-14 category. Proud winners in the Bombay City District Amateur Athletic Selection Trials. Tejas, Sankalp, Sakshay, Vatsal & Benjamin has been selected to represent Mumbai City in the Maharashtra State Athletic Meet to be held in Pune on 19-7-2015. John Lewis (School Coach) has been selected as the Manager And Coach Of The Mumbai City Team For Boys and Girls Under 14 Category for this meet. Our school u-16 this year did well to qualify in the Elite Group of eight at the MSSA organized Harris Shield tournament. The team was unlucky not to qualify for the semifinals of the Harris Shield. The first innings lead separated the two teams in the last group match, and for us a place in the semis. In cricket, six of our students featured in Hindustan Times ‘Promising 30’. Article entitled Mumbai school cricket: talent aplenty (HT Tue June 19 2018). These were the very best of the city’s schools cricket talent. These young stars were picked by an expert jury, headed by former India batsman, Sanjay Manjrekar, who scanned the performances of the brightest school cricketers to identify the most promising 30. The school u-14 cricket team were declared runners-up in the inter-school Giles shield tournament conducted by MSSA. In the finals played from 8th to 10th Jan, 2018 at Wankhede stadium, the match against Rizvi was drawn, but we were emerged runners-up on the run quotient. Our u-14 school cricket team emerged city champions in the DSO inter-school tournament. In the finals of the Mumbai city championship held on 26th Oct 2017 at Oval Maidan, Churchgate, our team outplayed V.N.Sule Guruji Vidyalaya to qualify for the district championship. Master Prayag Jaiswal of Std 9-E won the Gold medal in 4×50 mts Free Style Relay at the Inter-Club CCI Swimming Championship 2019. He also won a Gold medal in 50 mts Back Stroke & Bronze medal in 50 mts Breast Stroke at the Municipal Corporation Swimming Championship held at Mahatma Gandhi Memorial Olympic Swimming Pool, Dadar. He won 2 Silver medals in 4×50 mts Medley & Free Style Relay at The 47th Bombay YMCA Inter-Club Swimming Gala 2019. In the 41st Annual Inter school Swimming Championship held at Y. M.C.A. Agripada, our swimmers 1)Prayag Phatak. 2) Dron Palande. 3) Arnav Wadekar. 4)Rugved Kotkar, made us proud by winning the silver medal in Medley Relay (4 x 50 mts). They were also the runners up in the overall championship! Master Aarnav Wadekar 4-D, won the Gold medal in 50 mts back stroke and bronze medal in 50 mts free style at the MSSA Inter-school Aquatic Championship held at Andheri Sports Complex on the 1st & 2nd December 2018. Master Tanish Dali 9B, picked up 3 gold medals 1000 mts (long lap), 500 mts (short lap)and Road Race at the Bombay District Skating Championship 2018, held at Dhote Udhyan, Mahim on 3rd & 4th November 2018. Master Rachit Lund of Std 8-D secured 2nd place at the Maharashtra State Schools Chess Championship 2018, held at Nehru Centre, Worli from 14th Nov to 18th Nov 2018. Master Anirudha Kaudhare 10-D, won the Silver Medal at the Inter-state Sqay Martial Arts Tournament held at Sanjeevani High School, Latur from 15th to 17th Nov 2018. Master Mauryansh Mehta 9-C won the gold medal at Mumbai (District level) U/14 DSO Taekwondo Competition held on 19th October 2018 at Dharavi Sports Complex. He will now be compete at the Zonal matches. Master Anirudha Kaudhare of std X-D, won a gold medal at the Inter- District Sqay Martial Arts tournament played at Dharavi Sports complex on 11th Oct 2018. He has qualified for the State level. Karan Gawane Std 10 F won the silver medal at the same tournament. Tanil Sheth – 8D, Winner of Gold medal in Kumite & Silver medal in Kata. Behramm Umrigar – 8B, Winner of Silver medal each in Judo & Kumite. Master Hriday Sangoi of Std 8-D won the bronze medal in the MSSA inter school chess tournament held at Dharavi sports complex in the first week of Oct 2018. Don Bosco School chess team won the first place at the IIFL Mumbai’s Biggest Inter School Team Chess Championship held on 25-26 Aug 2018 at GD Somani school Cuff parade. All are students of std 8th. Master Behramm Umrigar of Std 7-C won the silver medal in the Jigoro Kano Invitational Judo Championship 2017 organized by Bombay Judo Club. 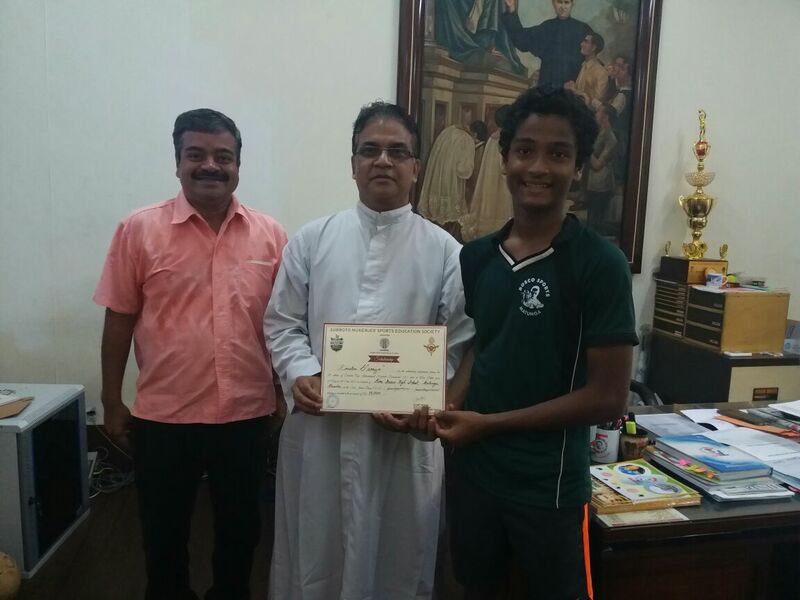 He also won a bronze medal at the Vibgyor Viva Inter school Judo competition held at Vibgyor High School Goregaon. Master Samrat Jadhav 5-D, won two gold medals in Martial Arts (Kate and Weapon Kate) in the 18th National Karate Sports Championship held at Kandivali Sports Complex. Master Jahan Bhaka Std 8 E, won the gold medal at the 2nd Shine Memorial Roller Skating Open State Championship 2017 held at Sacred Heart School, Kalyan. Master Urvaksh Billimoria 8-A, won the silver medal (U/14) and Master Behramm Umrigar 7-C, won the bronze medal (U/12) at the RYP Judo championship 2017 held at Prabodhankar Thackeray Krida Sankul. Master Ameen Khan of Std X-F won a Gold medal in 300 mts – Time Trial, Silver medal in 1000 mts – Long Distance & Bronze medal in 500 mts – Short distance at the 1st Indoor Open National Skating Championship held at Nashik on the 29th & 30th July 2017. DSO – Master Kabir Singh Banga and Om Sunil Mahadik of Std 10th won Gold medals (80 kg & 50 kg weight category) in the Junior & Senior Mumbai City Kick Boxing Championship -2017 held at District sports complex, Dharavi in July 2017. 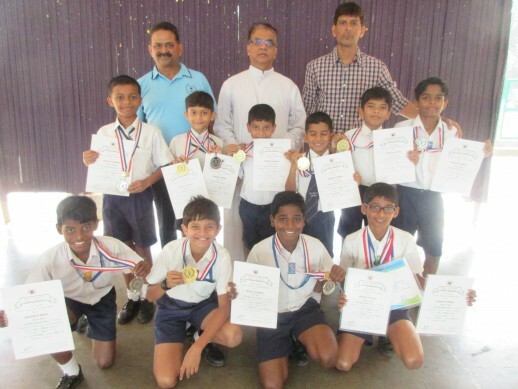 Don Bosco Matunga won the 1st place at the Mumbai Inter-school team chess championship conducted by Indian Chess school (ICS) at Don Bosco Borivali. The team comprised Monique Shah 6 D, Krishna 6 A, Snehil 6 C and Hrishikesh 6 C.
In Aug 2016, the school team comprising Hriday Sangoi, Monique Shah, Rachit Lund and Krishna Soni – all from Std. VI – stood first in the prestigious inter-school chess tournament organized by Prakash Vaze Sports Foundation. Master Aameen Khan won a gold medal in 2000 mts road race and two silver medals in 1000 mts rink & 500 mts rink race. He qualified to represent our school for the state level championship. (Jan 2017). Ameen Khan secured a place in the Guinness book of world records as one of the team members of the roller skating relay (24 hours) organized by Shiv Ganga Roller Skating Club – Belagavi, Karnataka. Mr. Aameen commenced his record on the 5th Nov 2016 and accomplished it on 6th Nov 2016. For the first time in the Pre-primary section, an achiever rose in the field of sports. Dron Palande, our swimming sensation from Sr Kg B, bagged 4 gold medals and a Championship cup for swimming in district level. 1. Gold medal in 25m breast stroke. 2. Gold medal in 25m free style. 3. Gold medal in 25m back stroke. 4. Gold medal in 25m butterfly. won a gold in the inter-school skating competition organized by ISPL. Won 2 bronze medals in District Rink race and District road race. Master Hriday Sangoi of Std. V stood second in the u-10 category at the Mumbai Parents Chess Foundation’s Open School Rapid Chess Tournament conducte by Mumbai Suburban District Chess Association. 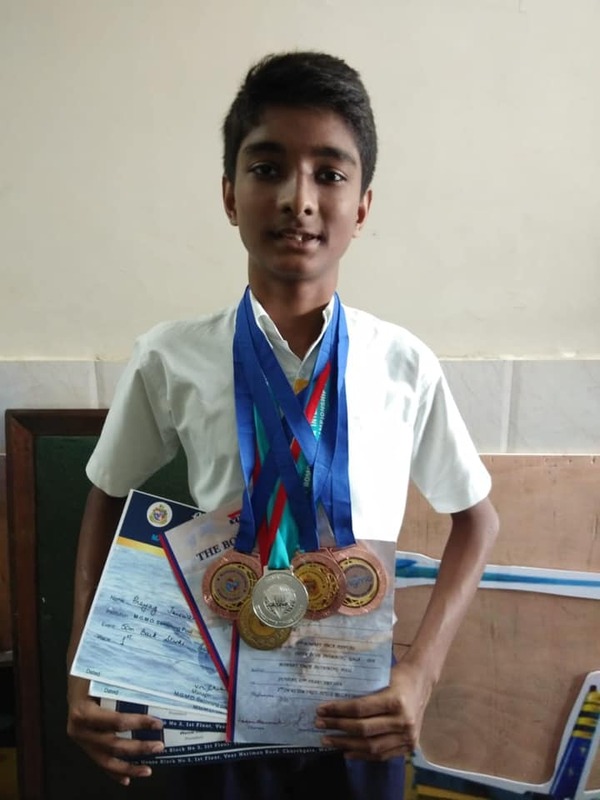 Our swimming sensation Master Rudransh Mishra of Std 10 F won 3 gold medals at the inter school DSO swimming tournament held at Dharavi Sports complex – Events : 100, 200 & 400 m free-style. In the 78th Maharashtra State Amateur Aquatic Championship held at Balewadi Sports Complex – Pune, Rudransh won one silver medal in 800 mts free-style and two bronze medals in 100 m free-style & 200 m free style respectively. Karan Shukla of Std. X won the most promising young player’s award at the Greater Mumbai Amateur Aquatic Senior Water Polo tournament.